The price that India will pay for the 10 per cent concession in Abu Dhabi's Lower Zakum oilfields will emerge after the bids are in for the remaining 30 per cent that the Emirate intends to lease out, Union Minister for Petroleum and Natural Gas Dharmendra Pradhan said on Tuesday.He also said the first oil from the Abu Dhabi National Oil Co (Adnoc) for India's strategic petroleum reserves at Mangalore - under an agreement signed with the Indian Strategic Petroleum Reserves Ltd. during Prime Minister Narendra Modi's visit to the UAE last week - would be arriving in May this year. Modi's second visit to the United Arab Emirates (UAE) resulted in an Indian consortium gaining stake for the first time in Abu Dhabi's massive oil resources.An MoU was signed on Saturday in Abu Dhabi between an Indian consortium comprising of state-run explorer ONGC Videsh, Bharat PetroResources, Indian Oil and Adnoc for the acquisition of 10 per cent participating interest in its offshore Lower Zakum Concession.The UAE is one of the largest suppliers of crude oil to India and is also the 10th largest investor.The consortium, led by India's ONGC Videsh, contributed a participation fee of Arab Emirates Dirham (AED) 2.2 billion ($600 million) to enter the concession. The concession will be operated by ADNOC Offshore, a subsidiary of ADNOC, on behalf of all concession partners.The agreement, which has a term of 40 years and an effective date of March 9, 2018, was signed by ONGC Chairman Shashi Shanker and ADNOC Group Chief Executive Sultan Ahmed Al Jaber.Abu Dhabi, which is a constituent of the UAE and holds most of latter's oil reserves, is looking for new partners at its offshore fields in the Persian Gulf as the current production concession for some deposits expires next month.According to a statement from ONGC's overseas arm, the current production at the Lower Zakum field is about 4,00,000 barrels a day, while the plan is to increase the target to 4,50,000 barrels a day by 2025.Adnoc's offshore fields currently produce about 1.4 million barrels a day, an Adnoc statement said. Increased production from its offshore reservoirs is part of the state-run company's plans to raise its onshore and offshore output capacity to 3.5 million barrels a day by the end of 2018, it added.The company also said it had received more than 10 bids from firms seeking to operate these offshore fields. This agreement will enable Adnoc to cater to a part of India's massive oil demand, over 80 per cent of which is met by imports. The MoU is an important milestone in India's search for energy security, at a time when oil prices have started hardening again mainly due to output cuts put in place by the Organisation of Petroleum Exporting Countries (OPEC) and non-OPEC producers deal with a supply glut that was pushing down prices till last year. During Modi's visit, Adnoc also signed an agreement with the Indian Strategic Petroleum Reserves Ltd. to implement the strategic crude oil storage facility on India's western coast in Mangalore (Karnataka) for the storage of 5.86 million barrels of Adnoc crude in underground facilities.Pradhan also told reporters here that the situation had changed from the time that India would be sending emissaries to oil-producing capitals in search of crude supplies. In order to tap the massive Indian market, countries were now sending their energy ministers here, he said, pointing to the upcoming visit of ministers from Saudi Arabia, Iran, and the US. "We have to have good relations with all, in line with our traditional philosophy of 'Vasudhaiva Kutumbakam' (the world is one family)," he said.Pradhan also mentioned the hosting of an LPG 'Panchayat' on Tuesday by President Ram Nath Kovind at Rashtrapati Bhavan.Organised by the Petroleum Ministry, the 'Panchayat' aims to provide a platform for LPG consumers to interact with each other, promote mutual learning and share experiences. Each such Panchayat has about 100 consumers coming together to discuss safe and sustainable usage of LPG, its benefits and the link between clean cooking fuel and women empowerment. 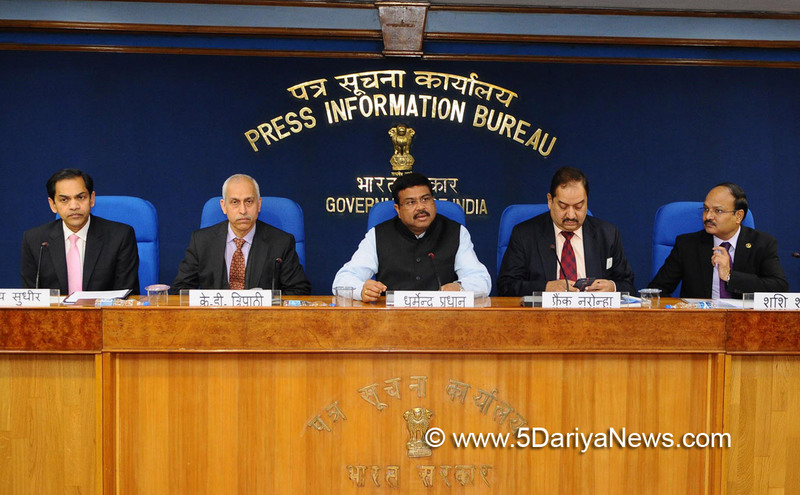 The Ministry intends to conduct 1 lakh such 'Panchayats' across India by March next year, Pradhan said.